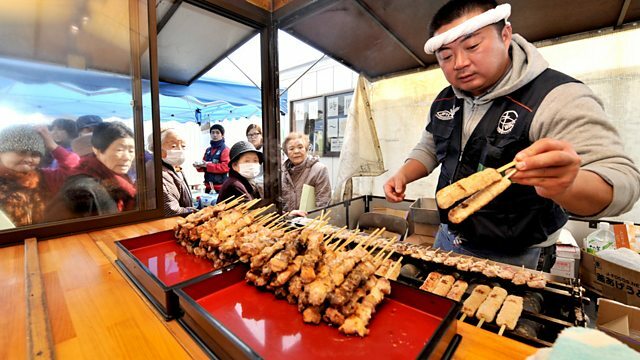 Richard Johnson reports from Japan on the impact of the Fukushima disaster on food. How has the threat of contamination changed attitudes to the nation's prized food culture? A year ago, Japan was hit by the catastrophic Tohoku earthquake and tsunami. In the days that followed, reactors 1, 2 and 3 at the Fukushima nuclear power station experienced full meltdown. The fears of catastrophic radioactivite contamination led to a 20 km-radius evacuation around the plant, while engineers risked their lives to stabilise the reactors. It was the world's worst nuclear disaster since Chernobyl, but that wasn't the end of the story. A longer-term food story started to emerge. A testing regime was introduced to monitor radiation levels in the food supply chain. The World Health Organisation is also carrying out its own tests to ensure that absorption of caesium through food, over decades to come, doesn't become a major threat to public health. But as Richard Johnson discovers, confusion and lack of information in the early weeks of the crisis has led to suspicion and mistrust among large sections of the Japanese population. For this reason, the disaster is likely to not just change Japan's relationship with its politicians, but also its food culture.